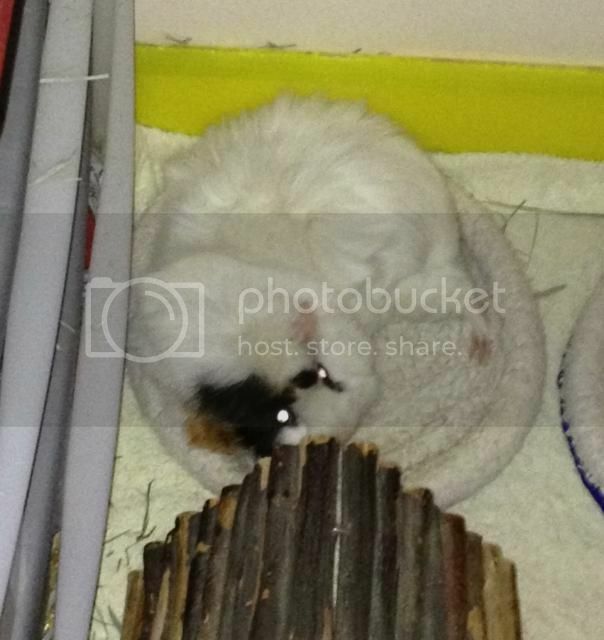 Misty is now back in a hospital cage after her op. The op itself went well but she has lost a fair amount of hair through stress. Much from her belly and a few chunks out of her flanks. The mammary tissue and lump have been sent for histology but her full body X-ray was clear with no obvious cause for concern. Hopefully new boyfriend intro to GL will happen soon! Glad Misty came through ok. She should get her hair back now that the hormones are taken care of. Hoping for a good recovery! I'm glad to hear Misty is home and doing well. Yay for Misty being home. Continued best wishes on her speedy recovery. OK, Misty is doing well in her recovery, although bored to tears in her cage and she still has bald patches. The new boyfriend visits frequently but probably doesn't help the situation as he wanders off when there's no sign of her coming out. I guess we should have a little formal introduction to the new handsome man in our lives. It may be changed, but at the moment he is currently nicknamed Captain Chaos after the Cannonball Run character and bumbling superhero, both perfectly apt for the way he does zoomies about the place and causes utter chaos as he shoots past Misty's cage and she throws a hissy fit not being able to join in. So, did anyone guess this superhero's identity?! He has made the cupboard his own. Discussions on a possible breakout. Oh, man, he is cute!! It's him, it's him, it's him! I secretly hoped it was. He's the fella that caught my eye. Pleased to make your acquaintance, Captain. I hope Misty's recovery is speedy so she can come out and join him. He's adorable and they look excited to be see each other. Glad to read Misty is recovering well and can't wait for her to meet up with him and touch noses (or whatever they'll do when they meet). Misty gave me a scare (and herself) last night by getting stuck in the bars of her cage chewing to get out to her boyfriend. She'd managed to hook her top teeth over a bar then shove her nose through the space above turning her head in the process and ended up wedged against an upright bar. All I heard was faint baby squeaks like a lost youngster and found her absolutely motionless with her nose wedged through the bars. Luckily when Misty is panicked or scared she freezes. I checked where her teeth were, and managed to move her teeth and nose along a bit and turn them slightly to get her teeth unhooked and her nose pushed back and free her. Big sighs of relief all round! It didn't stop her chewing the bars completely but she did it more on the plastic base instead. Thankfully she has a checkup at the vet tonight and may get the all clear to get more freedom. Misty has now had her final vet post op check and everything is going really well and her hair is growing back around the wound site. So far it is slow to grow back where the stress patches are but her hair is so thick you don't notice them. She is now free to roam with her boyfriend and bosses him about at every opportunity. He takes it all in his stride with much excited squeaking at times. I did let them together early as the constant squeaking from Misty was getting to all of us plus she was getting VERY bored in her hospital cage and getting herself into trouble. Aw! Well done, Misty :) and I love the name Marley - and the associated connections are really good too! We always had names starting with an 'M' but I ran out of ideas! I didn't have a Misty or a Marley! I love Marley's new name. It does suit him very well. Glad they're getting along. I just wish their nightly discussions were a little quieter. It never gets really dark here at this time of year and the poor boy is not quite so used to seagulls who are clearly organising the daily sortees from my bedroom roof at 4 am. Marley has to join in, which brings complaints from Misty and occasionally myself when I feel it has gone on long enough. Then he decides it must be breakfast time since its now very light outside so he trots back and fore to the cage. I haven't been able to cross the piggy language barrier yet that breakfast is still 4 HOURS AWAY! They have at least learned that when my radio alarm goes off and music starts plying that 'she' will get up soon and feed them so I often find them already in the cage waiting for breakfast by the time I've blearily stumbled out of bed after my early morning interruptions. Your place sounds very interesting in the morning. You'll never have to worry about sleeping too late again! I'm glad they are getting along so well. The nightmare continues and truly the end of an era. 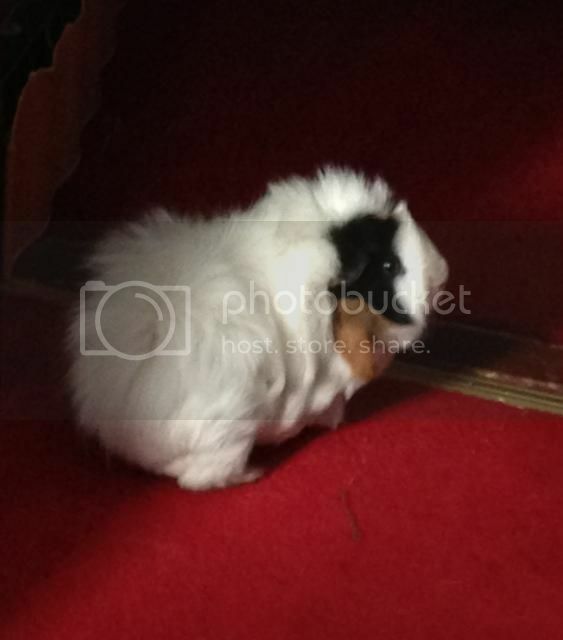 Sadly I've lost another piggy. Misty had been treated for a URI 3 weeks ago and got the all clear at the vets about 10 days ago. Sadly something came back with a vengeance on monday night when she was off her food and didn't have the usual loud shrieks at teatime. I still had a few doses of Baytril left so she got one of those and I called the vet first thing tuesday. I live close enough that she got an appointment first thing, was x-rayed and heart meds discussed as it was unsure from the x-ray if it was congested lungs or enlarged heart. She was started on meds while still at the vets and I took her home at lunchtime. 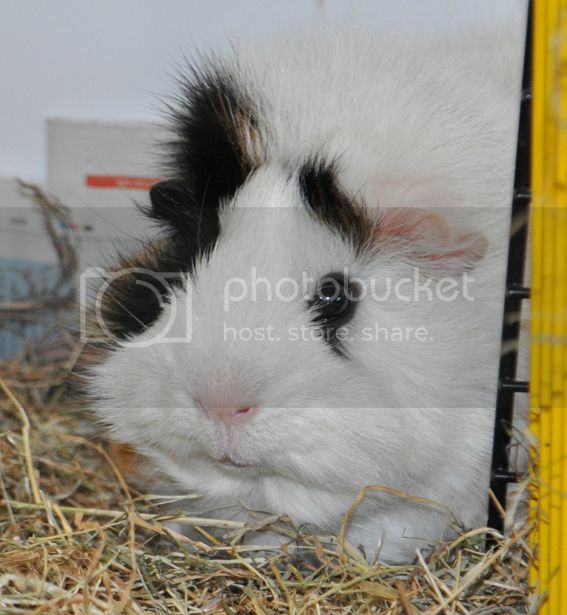 The poor piggy had very heavy breathing and was not a good colour and with her having so much white it was easy to spot. 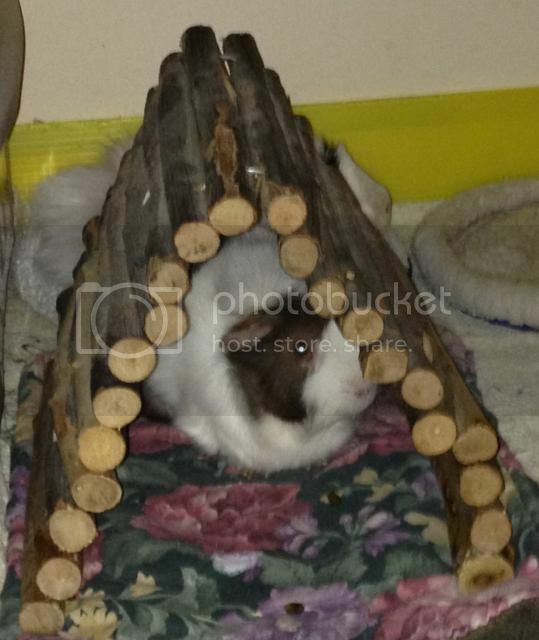 Luckily Marley will only be on his own for a week before going back to Thistle Cavies. He was only ever on loan and I'm heading over there next week for another visit. He will be back with his girlfriends as before. So sad as I was hoping to catch up and update Tiggy's Tales with lots of pics of the happy couple since I will be on holiday for the next 2 weeks. Since I'm due to go into hospital in October and with recovery time I won't be getting any more piggies for the foreseeable future. For the first time in 15 years I'll be pigless and petless! I'm truly gutted. Oh Webs, I'm so sorry. Oh Webs! I'm so so sorry. Hugs and tissues.